The Federal Reserve statistical releases make up one of the largest collections on FRASER. These data publications cover a broad range of topics and data in various formats and cover a lot of the Federal Reserve’s history. 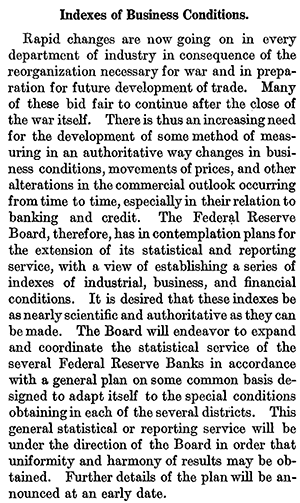 Many people don’t know that early on, the Federal Reserve was a collector and distributor of national and regional data. It developed index data for wholesale prices and industrial production and published this data regularly and consistently. The releases reflect the assessment of the economy at that point in time. Some of the topics covered are the U.S. economy (industrial, agricultural, etc. ), the banking industry, and Federal Reserve operations. The data for the statistical releases come from multiple places, including banks, financial institutions, consumers, survey responses, other Federal agencies’ data, and data purchased from vendors. The releases are very complicated and can be interesting, frustrating, or confusing—sometimes all three at once. Because they were historically not well distributed (Fed documents are not part of the Federal Depository Library Program), there is no complete collection held anywhere. It is therefore difficult to assemble a complete run (particularly for older series). Even worse, multiple titles occasionally have the same data, and the same title was sometimes reused for different data (for example, G.17, G.17, and G.17). Unfortunately, as time passed, the Board combined releases or changed how often they were issued, so a release’s letter may not always match its most recent frequency. FRASER has 98 of the known numbered releases (none of the unnumbered); the total number of items in our collection is more than 50,000. To make this valuable data available to the public, FRASER staff have been working on the statistical releases for over a decade. The releases are complicated, so from 2006-2014, we did our best with the information they provided when we processed and posted them on FRASER. This work was done in phases: In 2006, to support the Board data on FRED, we started digitizing the statistical releases in cooperation with the Board of Governors, scanning paper releases in-house. In 2012, in preparation for the Federal Reserve’s centennial, the Board scanned all of its statistical releases not already on FRASER. These digital copies were shared with FRASER and were added to our collection starting in 2014. As we ingested the thousands of newly available issues, we reassessed our collection and made corrections to our metadata. Throughout 2014-2015, we started more in-depth investigations in response to user requests for specific issues. We do ongoing and in-depth inventory because we have more statistical releases than anyone else (inside and outside the Federal Reserve System) and want our collection to be complete and correct. We work with our partners in the many Federal Reserve libraries to get releases that they may have but that we do not currently have in our collection. It’s sometimes hard to figure out what constitutes complete—it’s not always clear if things are missing or were never published. Sometimes this is due to the multiple types of changes, such as title, publication frequency, and release number changes. Although we rely heavily on Seldin’s paper, we have come across mismatches between the documentation and the physical copies we work from. In the past few years, we have found titles that are not yet listed, issues for years that weren’t documented, and name changes that were forgotten. We do use the Publication History as our cataloging guide, making a separate FRASER title for each title in the list. Still, sometimes we need to work around our usual procedures to make the data easier to read and to avoid extra processing (for example, keeping the H.10s attached to H.13s). FRASER staff do many more things behind the scenes to prepare statistical releases for FRASER. We revise existing metadata as we work on expanding individual release titles to make everything as correct and consistent as possible. We look at the available documentation, the physical copies we have, past work we have done on the releases, and emails from researchers and librarians about the releases. Then we compare the documentation we have to the physical copies. When looking through the physical copies, we are always happy to find letters and memos in the collections we work on. They often explain why there may be a gap in publication of a particular release. Reasons for a release not being published can range from a blizzard to a release being on hiatus while it’s computerized and redesigned. The revision process can be like digging for buried treasure—we don’t know what we’ll find! We once discovered some totally unrelated G.26 supplements in the middle of a bound volume of H.4.1 releases. Before we post additional releases, we go through what we already have on FRASER to look for typos, to make sure issues are complete, and to note any missing issues and other irregularities. We go through the physical documents to find the ones we need to add to FRASER and get them ready for scanning. As we digitize, we document findings and thoughts on the releases, such as issues we are still missing, typos on the individual releases themselves, changes in the title, etc. For especially complicated releases such as the E.15 that were released monthly, quarterly, and annually, we may need to make a table to figure out if any issues are missing. We then digitize the documents and create new metadata so that they’re ready to post on FRASER. When these tasks are complete, we look over all of the new information we have compiled and make sure all internal and external documentation and our needs list (xlsx) are updated. Finally, everything is given another quick check for consistency and then added to FRASER for everyone to see and use! Katrina Stierholz. “Federal Reserve Board Statistical Releases on FRASER.” Beyond the Numbers Conference (October 6-8, 2016). Sian Seldin. “History of the Federal Reserve Board Statistical Releases.” Beyond the Numbers Conference (October 6-8, 2016).